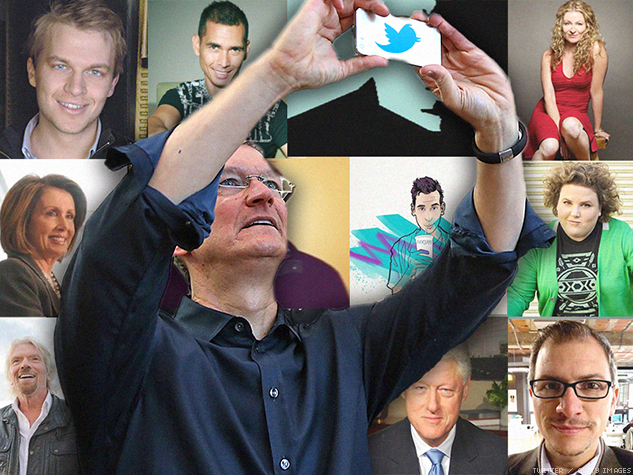 Comedians, newsmakers, and fellow gay techies weigh in on Apple CEO Tim Cook's announcement that he is gay. Apple CEO Tim Cook made waves this morning, not because of any tech announcements, but for something more personal. In an essay published in Bloomberg Businessweek, Cook revealed to the world that he is gay and that he considers "being gay among the greatest gifts God has given me.” This makes him the first CEO of a Fortune 500 company to be out while holding the position. Here are 20 reactions to Cook's statement. CEO of Apple, Tim Cook announces he is gay - Now we wait for the Samsung CEO to announce that he's wayyyy more gay.
.@tim_cook, congrats on taking pride and making it easier for others throughout the world to do so! But when will Tim Cook come out about Apple Maps directing me to the bottom of the ocean every time I just want to get to Starbucks? Apple CEO Tim Cook comes out. Ellen launches video sharing site "ellentube". It's a great day to be gay. Tim Cook has just announced that he is gay. In other news, Samsung says they are even MORE gay and were the FIRST to be gay. I’d totally go gay for Tim Cook and a retina iMac. And maybe a new iPad. Tim Cook has come out as gay and I think it should be up to each individual state whether to keep selling Apple products. Tim Cook: "I'm gay" Tech community: "So?" If only the whole world was like that. Also: First person to use the headline, "Apple's Tim Cook: iGay," you're either fired or promoted. I haven't decided yet. For more geeky gay goodness follow Dustin Diehl on Twitter @DRJedi.